A great way to view the world! So Ike and I took time off last week. Ike spent his week off just being a horse – no demands of his time except for feeding time. Rumor has it that he did look for me every time he heard a car come down the driveway. While he might have missed me, I think he enjoyed living like his brother, the lawn ornament. I spent the week on Ocracoke Island with my husband and our dear friends imbibing on some adult beverages and engaging in some serious hands of Spades. While I love to get away from the daily grind, I do miss our dogs and horses while we are gone. How can you not miss sitting astride your horse and the ease of their power? We caught the 4:30 a.m. ferry off the island (yes, we are those people) and were home by 10:30. That meant that there would be some saddle time that afternoon! What a great greeting I received upon arrival at the barn. Every horse, except for Ike, nickered as I said hello. Ike promptly greeted me with a gentle nudge, then gave me his “mean face.” I suppose that was him admonishing me for leaving him for the week. He is quick to forgive…after a Stud Muffin or two were procured. Had a moment of panic when I saw Cigar’s face with what looked like blood splattered on his forehead. Thankfully, it turned out to be pokeberry juice. Such a shame that he has to resort to eating pokeberries rather the alfalfa/timothy hay that he is provided. Enjoyed a short but productive ride with the realization that the CBLMs are only three weeks away. So much to accomplish in the next few weeks. The training plan involves mostly pure training rather than test riding. Training Level Test 2 and First Level Test 2 are good tests for us. We’ve been consistent with our scores all season, so no need to drill the movements. We are just going to work on climbing the training pyramid which will only make our tests better. It is shaping up to be a busy week with the farrier and vet stopping by, but hopefully there will be plenty of saddle time! It is high time that I finish my review of my Romfh Feather-Lite Dressage Coat (http://www.romfh.com/show-coats/romfh-feather-lite-dressage-coat-202041). I’ve been able to use it at two full weekend shows, and it has been laundered, so I feel that I’ve given it a full test drive to give an honest opinion. And my final decision? This coat is well worth the money you will spend on it. For years I have shown in my very traditional black WOOL dressage coat. This coat has simple buttons and a classic cut. It has served me well and will continue to do so for years to come. But let’s face it, it is WOOL, and I live and show in the mid-Atlantic region which means hot summers with sauna level humidity. Needless to say, I would offer up a happy dance every time coats were waived. Sadly though, as I have aged, I’ve found myself wearing my wool coat even when I could be coat-free. Why? Let’s just say that there might be a little middle-aged spread happening in my abdominal region and the coat does a wonderful job hiding the sins of my overzealous eating and wine habits. So when I saw that Romfh was offering a dressage coat constructed with a micropoly/viscose/lycra fabric, I was excited to give it a try. Breathable fabric?! Yes please! One thing to keep in mind is that the coat runs small. I ordered a 12 Long since, I have broad shoulders and, as my mother calls them, I have monkey arms. If I wore the coat with only a bra underneath and stood perfectly still with my arms straight by my side, the size 12 fit. Since that would not be practical while astride Ike, I had to send it back for a 14 Long. This time the fit was spot on. I love the silver-toned buttons down the front that also adorn the sleeves and the back of the jacket. There is a Celtic pattern on the buttons that give some visual interest; Romfh also provides spare buttons just in case one disappears into the sand of the arena. The most exciting discovery for me was finding that the coat has real pockets including one on the interior of the jacket! Finally some place to stash a couple of peppermints, a tissue and a copy of my test. The fabric is soft to the touch and has some give that allows you to move comfortably. There is a mesh interior which does help with wicking away the sweat and air flow. That being said, the coat is still black and I did still sweat in it. The nice thing is that even when I sweat and rode in the rain on Saturday, the coat was dry Sunday morning by just leaving it hanging in the trailer. How nice to not have to put my arm into a still damp coat sleeve. I finally decided to take the plunge and wash my coat after my September show. My wool jacket of course is dry clean only. When you read the Romfh care label, it clearly states, “Do Not Dry Clean.” How awesome is that! I followed the instructions, started the washer, and said a prayer that I didn’t ruin my new coat. The coat came out of the washer in one piece. I hung it up overnight to dry. Happy to report that there was no “shrinkage” and my favorite part is that it does not need ironing. 🙂 [I don’t even know where my iron is and do not currently own an ironing board.] Machine-washable show clothes? Who would have thought it would ever happen?! Looking forward to wearing my Romfh coat at the USDF Region 1 CBLM Championship Show in October. Hoping that my coat brings me the same luck that it did in August and September! It Is All About Your Perspective. Our final regular season show is now behind us and there is only the Region 1 Colonel Bengt Ljungquist Memorial Championship Show (http://www.bglongaker.com/cblmain.htm ) left on the calendar. It is hard to believe that our third year of showing is almost complete. Where did the time go? As I reflect on our show last weekend as well as the season as a whole, I realize that I have much to be thankful for, more than just the satin ribbons that hang on the wall of my home office. At my show in August, I had my mental breakdown. Cried like a baby with my frustration about our performance. There, I said it. Now everyone knows. 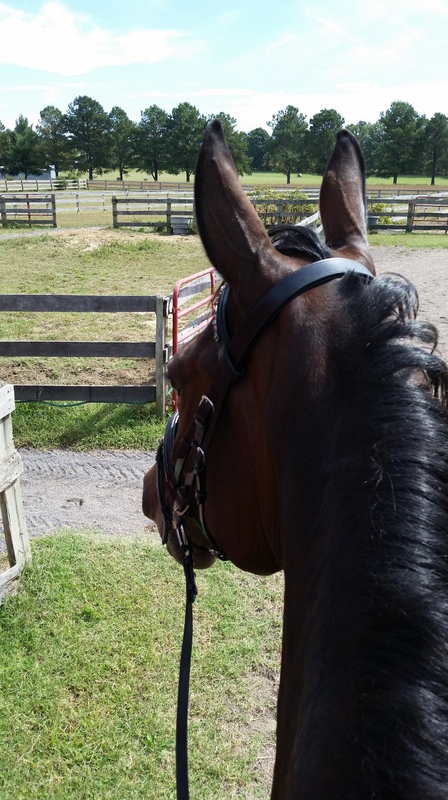 The frustration came from the numerous mistakes during my First 3 ride – cantering like an out-of-control freight train, falling out of canter on the canter loop, our inability to ride a centerline. and having the judge tell me to learn my leads (how pleasant of her). Just wanted to crawl into a hole albeit a big one so that Ike could get in there with me. During the weeks between that show and our September show, I have cried a few more times, but not because of my riding. 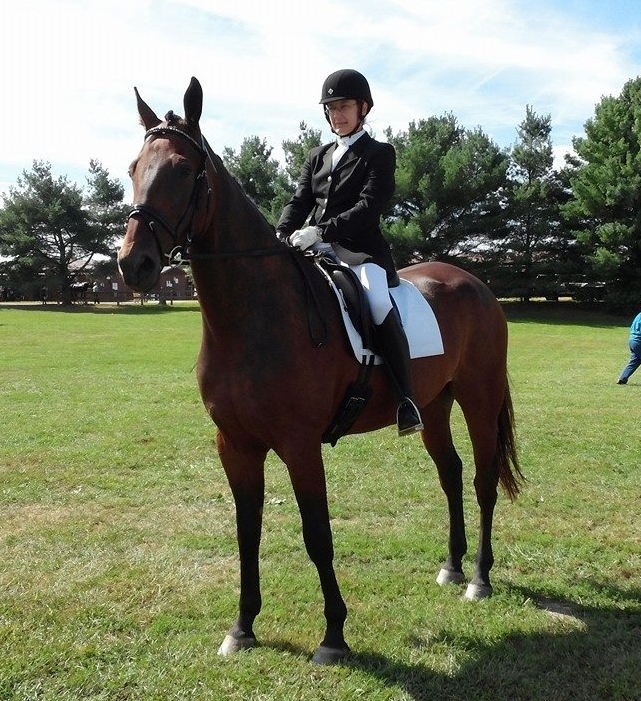 I cried when I heard the news that one of my dear blogger friends lost her sweet mare Sugar. It was completely sudden and unexpected. I never had the opportunity to meet Sugs, but I felt the loss as if she was my own horse. I am now crying again with the news that a dear coworker, who only just retired last year, is now in hospice care. How unfair life can be. These recent events have placed some perspective on how I am going to look at my show performance. We sometimes place too much importance on the attainment of a ribbon and a placing. I am as guilty as the next person of this. But, dressage provides us a way to rate our performance that has nothing to do with a ribbon. 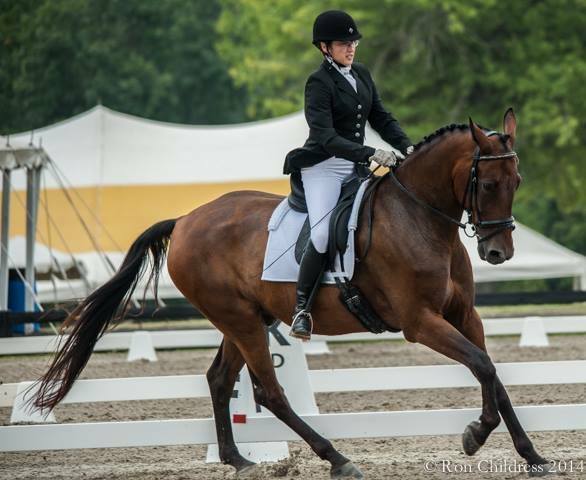 Whether or not you place, you get to take home your dressage test; the test tells you how the judge rated each and every movement of the test with comments for all the lower scores. Some judges will even give you comments with the higher scores. You need only read the comments to know what you need to raise your score. How lucky that we have written comments?! You can compete against yourself from show to show. I can head to the CBLMs and know that we are more than capable of riding Training 2 and First 2 in our championship classes. No matter how we finish, I know that we will have put forth our best effort. 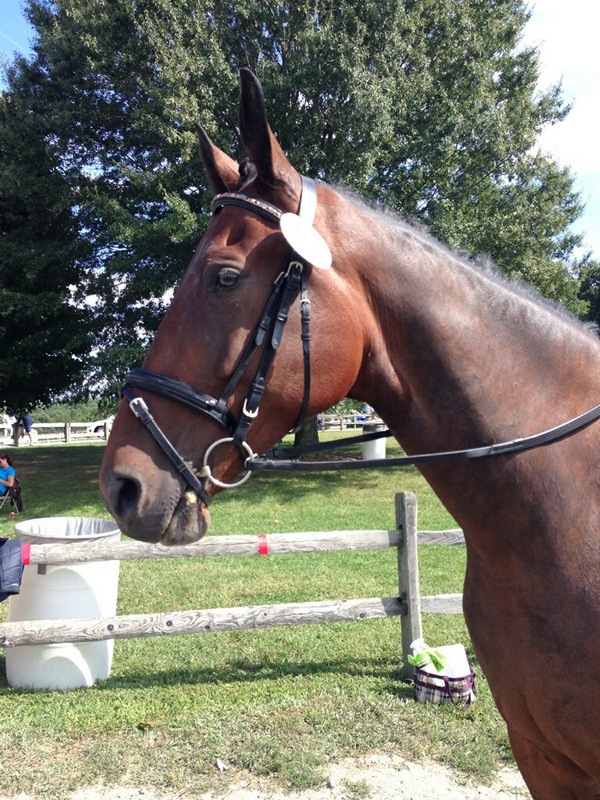 I am so thankful and grateful that I am able to own a horse and that I have the means that allow me to compete. I am lucky that we are both healthy are physically capable to do the sport I love. Life is too short and our time with our horses and loved ones is a gift. Remember to enjoy each and every ride. Can You Guess What They Tried To Do To Me Yesterday??? I have yet again seized control of the blog to share with my fans the whole truth and nothing but the truth. Mom just doesn’t do a stellar job providing you the facts. Mom forgets to take off her rose colored glasses sometimes as she skips through her days. The poor woman continues to struggle with what to do with her appendages. I hear her reminiscing about how I used to attempt to ram her knee into the fence since I couldn’t make all my body parts work together. Well here we are three years later and I am more than capable of coordinating my legs. I cannot say the same for Mom and she is almost 46 years old. Come on woman! Put your inside leg up near the girth when I’m cantering to help me bend. You can clearly see from the photo that she is incapable of listening while in the show ring. Just look where her leg is! Sheesh! And then she is surprised when I break from the canter or lean in. Will someone please tell her to be there to help me…yes, I do a lot of the work, but she’s got to learn to do her part for the team. I can only hope for better leg/seat/hand coordination at our upcoming show at Rose Mount. With only a week until the show, I have to hope for a miracle. That whole feed bucket debacle had nothing to do with what was in my feed bucket. I’m not really a picky fellow, except for peaches, those things are gross. I might have been pawing one morning while waiting for my breakfast and might have gotten my hoof stuck in the bucket. When I pulled back to get it out, somehow the bucket got in the way and it broke. Yeah, that is what happened. Or wait, is it too late to blame my brother. Yeah, he made me do it. Lately, it has not been fun to be outside. The weather has been okay, but the horseflies have been out in droves. We horses have decided that they are evil. We are pretty certain that they are the devil’s spawn sent forth to make us all miserable. I have mastered the tail flick and the neck-reach-around to combat the flying devils. My brother does a nonstop shimmy shake so that they cannot land on him. He only stops when Mom is close by and then he shows her where it is so she can kill it. While she is uncoordinated in the saddle, she does have lightning quick thwacking skills to kill the flies. Go Mom! And let me tell you about yesterday…Mom and I had another lesson with Ms. C. I’m pretty sure they tried to kill me. We worked very hard on the various movements that we will need for our upcoming show: cantering, trot lengthenings, canter lengthenings, centerlines, and leg yields. We didn’t stop much because the horseflies were lying in wait if we paused. After about 50 minutes I was breathing very hard. It was scary. I huffed and puffed and couldn’t catch my breathe. Mom dismounted and they hosed me off for at least 20 minutes (I didn’t think I was that dirty). Mom then stuck this tube of brown goo in my mouth. She called it “elektrolights.” I called it gross and tried to spit it back at her. After about 20 more minutes I felt better. I hope that never happens again. If you are going to be in town next weekend, come see me at the show. I love when my friends come to cheer for me! Especially the ones who bring snacks!